THE GUERRILLA ANGEL REPORT — [UPDATE: See below.] A local grass roots group is hoping again, to push the state legislators into adding the words “sexual orientation” and “gender identity” to Idaho’s human rights act. Tireless effort to do so has been underway since a 2006 poll showed firing a trans or LGBT employee shouldn’t be legal. The Idaho legislature, however, has always shut them out. This month at the opening of the 2012 session, the group tried again, this time backed by a creative “Add The Words” sticky-notes campaign, attempted to deliver notes from hundreds of Idahoans state-wide to the legislature. However, according to “Add The Words” spokesperson Mistie Tolman, they were stopped by a state trooper and shut out of the chamber. 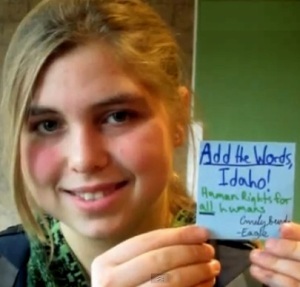 UPDATE Feb. 11, 2012: The Idaho state senate killed the “Add The Words” bill. Two Democrats for, 6 Republicans against. It didn’t get out of the committee. Letter to the newspaper: Mistie Tolman: Add the words ‘sexual orientation’ and ‘gender identity’ to Idaho’s Human Rights Act | Reader’s Opinion | Idaho Statesman. Maybe Idaho should throw Caution into the oncoming hurricane, the adopt the Anti-Discrimination Act 1991 (update 2004) of Queensland , Australia. Now THERE is an ACT that protects LGTBi’s in every way!!!!! I thought the State of Idaho was a bit more advanced between the lobes. Come on America. Everyone has equal right do they not. I thought that was what Canada and America was all about. Guess I was mistaken. Maybe we should start economic sanctions then. I’ve a hunch Idahoans will survive economic sanctions just fine. Besides, there ARE some great people in Idaho . . . just not enough yet.